From diving to motorsports to flying to exploring, Rolex has a knack for creating watches for a specific niche in mind that quickly become appealing to a much wider audience. And it’s no different with their Rolex watches for sailing. Rolex’s roots in the world of sailing stretch back to the 1950s when the brand formed a relationship with the New York Yacht Club. This paved the way for Rolex to become the Official Timepiece of the prestigious America’s Cup for almost three decades. Today, Rolex supports yachting across the globe. There are partnerships with the best yacht clubs, along with sponsorships of the best sailing competitions. With such strong ties to yachting, it is somewhat surprising that Rolex only debuted a dedicated sailing watch in the 1990s. Following our exploration of Rolex watches for diving and for traveling, we continue our Tool Watch Time series today with a look at Rolex watches for sailing. Introduced in 1992, the Rolex Yacht-Master is a great example of what a luxury sports watch can be. Part tool watch that can be used to measure elapsed times via the rotating bezel when sailing and part precious timepiece that flaunts an appreciation of nautical style, the Yacht-Master is the quintessential watch for a luxurious stint at sea. The Yacht-Master is also one of the most varied collections from Rolex. In fact, it’s the only sports watch collection from the brand that explicitly offers models for both men and women. Early Yacht-Master models included three different case sizes: a men’s 40mm, a midsize 35mm, and a ladies’ 29mm. Today, Rolex’s catalog offers Yacht-Master watches with either 40mm or 37mm cases. Material choices of the Yacht-Master are also wide. There are models in yellow gold, two tone steel and yellow gold, and steel and platinum. The latest version of the Yacht-Master is in Everose rose gold. The steel and platinum versions have always been one of the most sought-after among the Yacht-Master lineup. Wearers appreciate the beautiful finish of the sandblasted platinum on the bezel and dial. The current Everose Yacht-Master models are popular too, particularly since they were the first Rolex watches to come with the new Oysterflex black rubber bracelets. 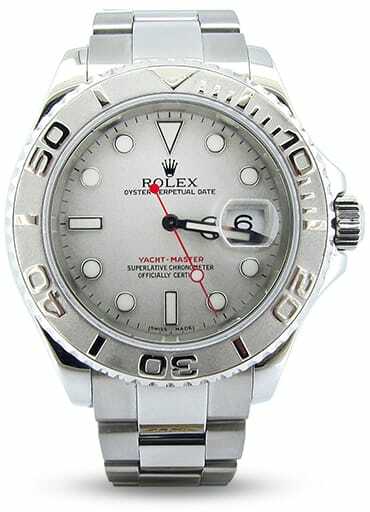 All Yacht-Master watches come equipped with a date window at 3 o’clock along with the Cyclops on the sapphire crystal. Like most Rolex sports watches, the Yacht-Masters have lume filled round indexes and luminescent Mercedes-style hour and minute hands. There’s even a lollipop-style seconds hand. These Rolex watches for sailing are water resistant to 100m (330 feet). This is thanks to their Triplock winding screw-down crown and screw-down caseback. In 2007, Rolex fortified their sailing watch offering with the technically impressive Yacht-Master II. Striking in both looks and functionality, the Rolex Yacht-Master II is vastly different from any other Rolex sports watch thus far. First, there’s the bold 44mm Oyster case, which along with the Deepsea, is one of Rolex’s largest watches. Then, on top of that case sits a bright blue Cerachrom ceramic bezel. The exception to this is the white gold Yacht-Master II with a platinum bezel. Not just for show, the scratch and fade resistant blue bezel is actually a Ring Command Bezel to control the countdown feature of the Cal. 4161 automatic movement within. Furthermore, the dial layout includes center hour and minutes hands and a small seconds subdial at 6 o’clock. There’s also the 1-10 minute countdown ring for the wearer to synchronize with regatta start times during competitions. The Yacht-Master II is available in a range of materials including steel, two tone steel and Everose gold, full 18k yellow gold, and 18k white gold and platinum. While Rolex built these timepieces for the competitive sailor, celebrities, athletes, and regular folk enjoy them just the same. Regardless of whether these Rolex watches for sailing are ever actually used for yachting, they are up to the task should the occasion arise. Realistically, the Yacht-Master and the Yacht-Master II are typically appreciated solely for their aesthetics, but their technical capabilities as tool watches for a life at sea shouldn’t be overlooked.